something to color with (if using the B&W version). string, thread, ribbon or wool. Print template of choice and color as necessary. Fold each piece in half (on the dashed line) so they are all colored on both the front and the back. Optional: Put thin cardboard in between the front and back of each template piece to make them a bit sturdier. Glue together so the pieces are colored on both sides. Cut on one of the dotted lines of each template piece (only cut as far as the dotted line goes, not all the way through the piece). Glue a piece of ribbon, string or thread onto the top (or hole punch a small hole and tie a ribbon through). If you hole punch, do it through the acorn that is cut from the bottom, not the one that is cut from the top. punch three holes in the bottom of the Ramadan template (one in the center and one on each edge). String one star through each of the holes so it hangs down from the Ramadan template. Punch a hole in the bottom of the middle star and string the fourth star through that hole. There are two different 3D star choices. 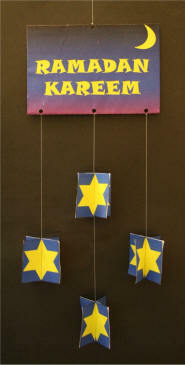 Print as many of templates 3 or 4 as you would like and add additional stars to the Ramadan template or the other stars. You can simply make the mobile as a Ramadan decoration or you can hang a 3D star on your mobile for each Eid good deed you do! 'numbers practice' -- count the stars. 'colors practice' -- color the background of each star a different color.